Jumping into beautiful alpine pools, sliding down natural toboggans and abseiling down waterfalls is fantastic fun and a great activity to try as a family. It definitely beats going to a water park!! 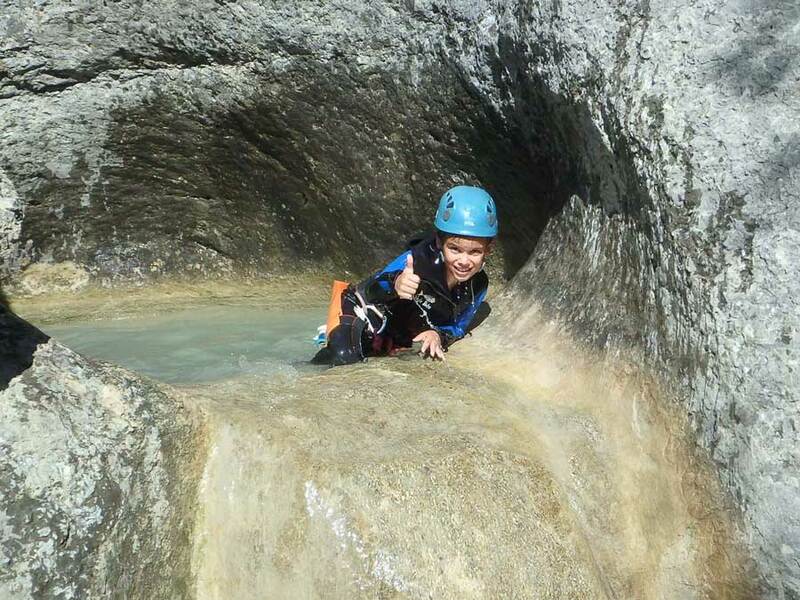 Canyoning is the perfect addition to all activity holidays for families. However canyons come in many shapes and sizes. They can be extreme and dangerous so you don’t want to end up in the wrong one with your children or even without your children! So how do you go about finding the right sort of canyon and what age is appropriate to start? First of all, it is important to understand what a canyon and canyoning is. A canyon is a natural gorge or canyon in the mountains where water makes it’s way down off the summits. Their form depends on the type of rock and the quantity and force of the water flowing down as this will dictate how it erodes and shapes the rock. You can find canyons with enormous and powerful gushing waterfalls through to ones with gentle currents meandering their way down the mountains and everything in between! The sport of canyoning is in effect navigating your way down these canyons. You start at the top of the canyon and work your way down by abseiling, jumping, and sliding! What Age Can You Start? 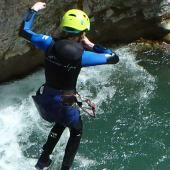 There is no official or legal guideline for what age a child can go canyoning from. However most canyoning providers including our canyoning guides at Undiscovered Mountains have developed their own advice and guidelines based on their knowledge of the particular canyon they are proposing and experience. 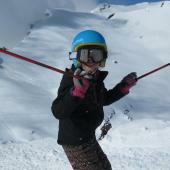 At Undiscovered Mountains we have a range of different canyons suitable for different age and abilities to choose from. For example, the kiddie canyon we use is in effect a miniature canyon and is great for children aged 7 to 10. There are pretty waterfalls and drops where children are lowered down, some great little jumps and slides as well as some fun meandering streams to play in. There are no big waterfalls, powerful water currents or hidden dangers like siphons on the route and it is easy to access. 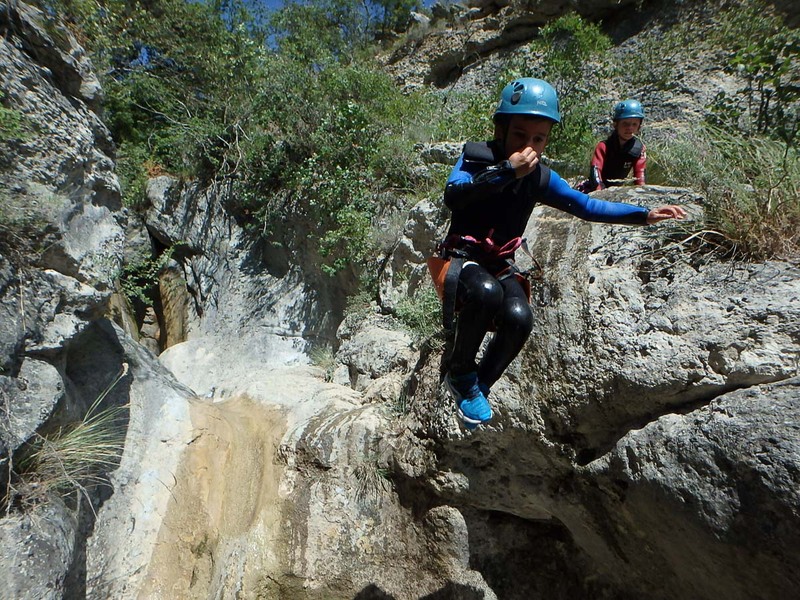 For teenagers and older children, we use a canyon with large pools to jump into, some fun drops and slides which can be done again and again as well as a big waterfall to abseil down at the end – great fun. Irrelevant of your age, you should be comfortable putting your head under water to be able to participate in canyoning. Swimming ability varies depending on the canyon with some more advanced canyons requiring strong swimmers but a general rule of thumb for most family canyons is to be able to swim a minimum of 10 metres. For child non-swimmers, there are some kiddie canyons with small and shallow pools where with the help of a parent, a non-swimmer can still have fun. If you are unsure about the ability of your child for a particular canyon you should ask the guide or company providing the canyoning. Canyoning is not something you should try as an amateur with children as it requires specific safety equipment, knowledge and techniques to ensure a safe descent. 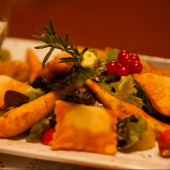 You should always choose a guided option. You need to wear specialised wet suits, a canyoning harness and helmet, which will be provided by your canyoning outfitter and your guide will have a full set of ropes and safety equipment adapted to the canyon you are doing. The difficulty of a canyon can change dramatically with varying water levels and they can be susceptible to flash flooding. You really do not want to be in a canyon that floods so using a fully qualified guide with local knowledge is essential. They will know the recent rainfall and weather patterns and have a deeper understanding of how an individual canyon behaves in different conditions. 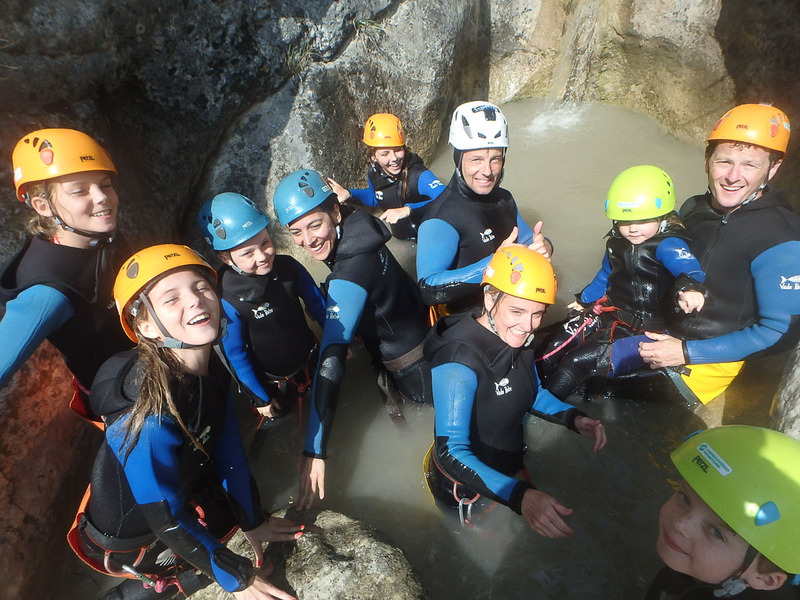 If you choose the right canyon for your family and have a good local guide, canyoning is one of the best activities to do for fun and lots of laughs together en famille. 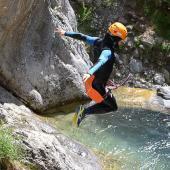 On our summer activity holiday in the Southern French Alps, canyoning is the activity that gets the best reviews from our clients and we highly recommend it to fun loving families looking for an adventure together!